Although our dental team has a passion for restorative and cosmetic dentistry, we also concentrate on general and preventative dentistry at our Encinitas, CA office to help our patients get their smile in shape and maintain a healthy mouth. With the latest dental technology and Dr. Cathy Santone’s extensive dental expertise, our goal is to create a relaxing and professional office environment and a positive experience with every visit. It is always a pleasure to come to the office. It is the perfect combination of professionalism and comfort. At Encinitas Cosmetic Dentistry we offer individualized dental care tailored to each patient’s dental needs and goals, whatever your age, for the whole family in an effort to establish and support healthy oral habits from the very first dental visit. Dr. Santone recommends routine oral exams to prevent unwanted dental emergencies like lost fillings or fractured or painful teeth and gums to ensure healthy habits continue to support a healthy mouth. Routine cleanings are essential to an overall healthy mouth and beautiful smile, which is why Dr. Santone encourages patient education and regular checkups. Our endearing, highly-trained registered hygienists tailor your dental cleaning visits to the individual needs of each patient. Working together with Dr. Santone, our dental hygienists play a vital role in detecting any early problems and ensuring our patients long term oral health and comfort, with a brilliant smile to match. Crowns, also known as caps, slide over teeth to hide misshaped, misaligned, discolored, or other imperfections in teeth. Crowns cover and protect cracked teeth, increase comfort, and offer extra support to those that are weak or damaged. If you have old crowns with black lines by the gums, metal-free crowns can be made that will vastly improve the overall appearance of your smile. To find out more about crowns, please contact our office today. A revolutionary anesthesia reversal remedy, OraVerse allows Dr. Santone’s patients to recover the sensation in their mouths twice as fast as before, following a procedure requiring numbing. You can return to work, speak, eat, and drink normally within a very short time after your appointment. Night guards, especially when associated with the correction of grinding to reduce migraine symptoms, can have a significant impact on our patient’s quality of life. To provide the necessary protection for your mouth, Dr. Santone also offers mouth guards for any need, as it relates to any of the following concerns: whether it is sports or stress related. Protect teeth during increased periods of stress, when patients tend to grind their teeth more often. Alleviate pain in a patient’s jaw joint and muscles, or pain commonly associated with migraine headaches. Even when patients practice proper oral health care, sealants are sometimes required to protect the hard to reach areas of the mouth between dental visits. Sealants can be useful in the prevention of decay and cavities, as they provide a protective coating to the tops and back of our patients’ teeth to help prevent and minimize the deleterious effects of dental decay. Teeth can sometimes have very deep grooves that dental tooth brush bristles cannot clean. Dental sealants can be applied to properly cleaned teeth to prevent future decay. This is especially true in our younger patients, where we have witnessed a reduction in the need for dental fillings. Oral cancer screenings are another part of routine dental exams and are an important way to maintain your overall well-being, as they can allow for the early detection of harmful changes in your mouth. Dr. Santone and her team utilize the latest techniques and technology in performing regular oral cancer screenings and detecting any suspicious signs. We understand that our patients often see their dental care providers more often than their medical practitioners, which affords us the opportunity to not only help you maintain a healthy mouth, but also to remain vigilant of changes to your health and to facilitate the appropriate referral. At Encinitas Cosmetic Dentistry, we utilize the advanced VELscope® Vx Oral Cancer Screening technology. 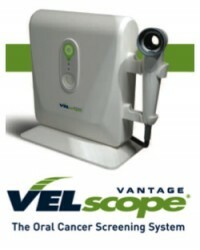 VELscope can help to identify potentially cancerous areas that can sometimes be missed in routine exams. Using a blue light to activate the natural fluorescence present in oral soft tissues, VELscope helps our dental professionals to see disease that is not visible to the naked eye. This invaluable tool can make it possible to locate dangerous growths in the early stages, and early detection is crucial to increase the chances of successful treatment. The entire screening typically lasts about two minutes and is completely painless. The Dental Intraoral camera allows Dr. Santone to educate her patients with a close-up assessment of their dental concerns, as well as the procedures required to correct them by providing a dentist’s eye view of the patient’s teeth and mouth. For Dr. Santone, the intraoral camera is a great way to show patients how their mouth and teeth change over time, while documenting teeth position and general wear and tear. The intraoral camera is completely optional for patients that would rather not get the close-up view. TMJ disorder refers to a wide range of jaw joint dysfunctions that can cause pain in the head and shoulders, as well as lead to difficulty chewing, yawning, or moving the jaw. Also referred to as TMD, TMJ disorder is a very common condition that can arise when the temporomandibular joints, which allow you to open and close your mouth, become inflamed, misaligned, or knocked out of position. This often throws off the delicate balance between the nerves, muscles, cartilage, blood vessels of the jaw, resulting in a number of symptoms that range from tension and inhibited jaw motion to migraines and sore facial muscles. Our dentists use non-surgical techniques to identify the cause of TMJ disorder, minimize painful symptoms, and restore proper function of the jaw joints.